Solid colors need not apply. Plants, patterned textiles, good vibes, and lots of textured accent pieces are just a handful of highlights from a bohemian-inspired interior. To get the look, you can follow a decorative approach that aligns with “the more, the merrier.” And top on the list of this trendy style‘s common motifs is an abundance of eclectic prints (think: layer upon layer that goes beyond the usual pillows, throws, and upholstery). While the method seems relatively simple in theory, in practice you might just find yourself struggling to pull it all together. Mixing and matching patterns like a pro isn’t as easy as it may seem. With that, we turned to the spaces that take a maximalist approach to decorating with an eclectic slew of prints to help you get on your way to boho-chic living. See for yourself. A porch is the perfect place to play with a bohemian feel. This relaxing outdoor area has the perfect mix of similar geometric prints in a broad range of colors. Bold, rich colors look incredible against all-white walls. By keeping the decor simple, the patterns work well without feeling overdone. This dreamy space is ideal for those who want to combine prints in a subtler way. The trick? Go with a muted palette throughout, so the whole room draws you in, rather than just one piece. Earth tones look great when brought together in one space. Bonus points for the cowhide stool and woven basket that contribute additional texture without being too overwhelming. Overkill? Never. We love how each hue echoes back to the multicolored tapestry hanging behind the bed. For those with limited space, a wall makes a chic surface to add… another rug. Design pros love this tip for creating an extra cozy room. Visit Design Sponge for a tour of the full home. 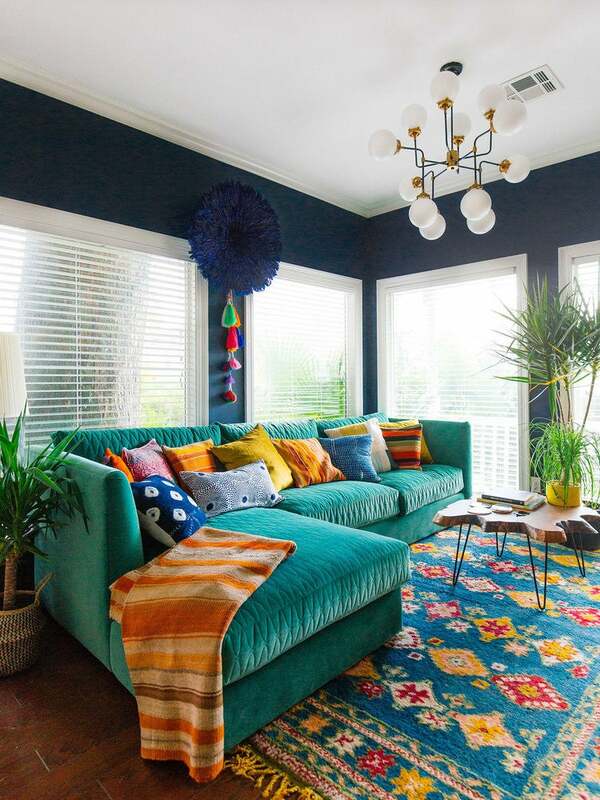 This living room is the epitome of bohemian style, where pattern, prints, and colors all find a home and complement (rather than compete) with each other. Prints don’t have to be confined to textiles. Textured decorative accents, such as wall-mounted baskets and bowls, add color and visual interest, too. Although these shibori curtains take center stage, it’s hard not to miss the variety of pattern scattered throughout this boho space. Consider this a solid lesson in mixing and matching prints, specifically with the living room in mind. When working with such an wide array, stick to a reserved palette to keep things cohesive. Representing the maximalist camp in boho design, every inch of this living room is used to its full potential. From shibori to ikat, there’s no shortage of bold details to inspire you. Detailed wallpaper? Check. Graphic sofa throw? Check. Eye-catching rug? Check. The rich layers of this saturated living room boast just the right amount of artful pattern mixing. Color enthusiasts need not shy away from combining the brightest pieces in a small space. We love a good rainbow moment, especially when you double down and outfit the gallery wall in equally vibrant hues. A vibrant patterned rug steals the spotlight in this living room, but a handful of quieter patterns tie the boho-chic look together. Including a bunch of patterned textiles in your room doesn’t have to result in an overly bold statement. This padded seating area feels serene, thanks to the simple white flooring. Sophisticated, black and white-based decor can channel a bohemian-inspired vibe—allow this high-contrast living room to serve as a prime example. Using throws as covers for the sofa or chairs is an easy way to incorporate pattern into your home, if you want to avoid committing to something more permanent. Nervous about mixing prints? Choose a throw and rug that are almost the same. That way, the need for establishing a color palette is done for you! The texture of the rug alone is enough of a show-stopping detail. Add pillows and throws on the sofa, and you have the most comfortable and inviting setting to curl up in. This story was originally published March 2017. It has been updated with new information.